Sponge Cake (pantespani, in Greek) is the base for many desserts. Using this basic recipe you can make birthday cakes but also many other desserts. 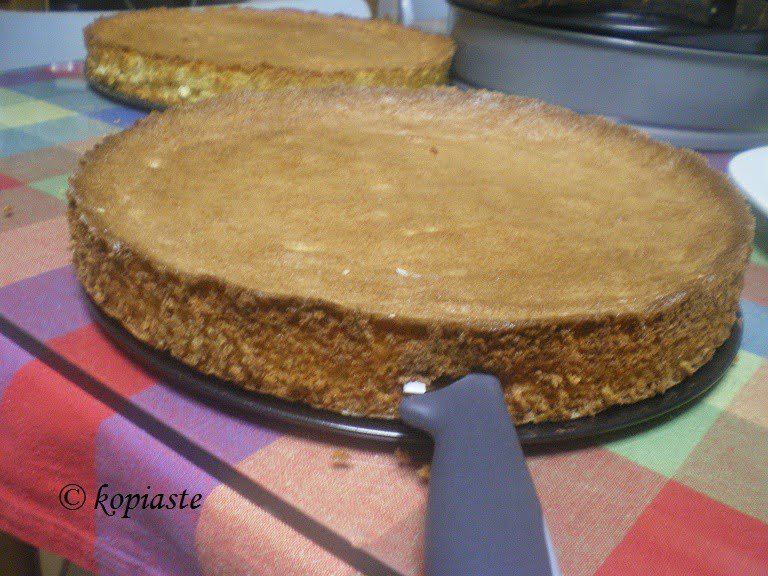 Pantespani, is one of my favourite kind of cakes, which I use to make birthday cakes. Sometimes I make it plain and sometimes I add dark cocoa in it and I love that it is so versatile that you can make so many different things with it. I make Birthday Cakes with different fillings and decorations and with the same recipe I also make Swiss Rolls or roulades. Sponge cake can be used as a base for different kinds of cakes and desserts. The most important part is to take great care to incorporate air in the beating, whisking and sieving stages. The method shown below is when you use a hand mixer. You should be cautious when breaking and separating each egg. You should do it in a different container because if yolk falls in the egg whites, the meringue will not become stiff. Lemon juice is added to the egg whites which helps make the meringue stiff. If you have a very powerful stand mixer you do not have to whisk the egg whites separately. The egg whites must be beaten in a clean bowl with no traces of fat in it. To make the meringue stiff, use either lemon juice or some salt. You can also use cream of tartar, if you like, but I prefer using lemon juice which adds to the flavour. If you want to cut the sponge cake into layers, it is best to prepare the sponge cake from the previous day or at least many hours in advance so that you may cut it easier. To cut the sponge, use a serrated knife. In a measuring cup add two tablespoons corn flour (starch) and fill it with all purpose flour. Sift the two kinds of flour into a sifter set over a bowl before using, a few times so that they are well combined. Use it in any recipe using cake flour. To make a chocolate cake flour, substitute 1/4 cup all purpose flour with dark cocoa powder. Sift the flour and corn flour and mix with all the dry ingredients. Whisk eggs whites with lemon juice until eggs are stiff. In a separate bowl beat yolks with sugar and vanilla until light and creamy. Gently fold in the meringue using a spatula. (Alternatively, if you have a powerful mixer, beat the eggs (whole) with the sugar on high speed until white and fluffy. Lower speed to minimum and add the remaining ingredients). Preheat oven to 180οC – 350οF. Line a 26 – 28 cm / 10 – 11 inch diameter spring-form pan with parchment paper and add the mixture. Bake for about 50 minutes or until a knife inserted in the centre of the cake comes out neatly clean. Remove to a wire rack and allow to cool before cutting it. Use a baking tin 35 x 40 cm, which is lined with parchment paper. The height of the batter should not be more than 1 – 2 cm before baking. However, the baking time is reduced to 20 minutes. When it is baked, sprinkle the sponge with icing sugar to cover all its surface and roll it with the paper while it is still hot. The icing sugar will help so that it will not stick into one piece. It should be rolled while still warm, so that it takes the shape of a roll. When it cools, carefully remove the paper. If the sponge breaks, don’t worry as it will stick again when the icing is added on top. Add your favourite filling and decorate. Sponge Cake (pantespani, in Greek) is the base for many desserts. Using the above two techniques, you can make different birthday cakes but also many other desserts. Preheat oven to 180οC - 350οF. Line a 26 - 28 cm / 10 - 11 inch diameter spring-form pan with parchment paper and add the mixture. The height of the batter should not be more than 1 - 2 cm before baking. When it cools, carefully remove the paper. If the sponge breaks, don't worry as it will stick again when the icing is added on top. The sponge sounds easy to make. I will definitely give it a try!